Overall view of Mission Control Center, bldg 30, during the splashdown of the Apollo 13 spacecraft. 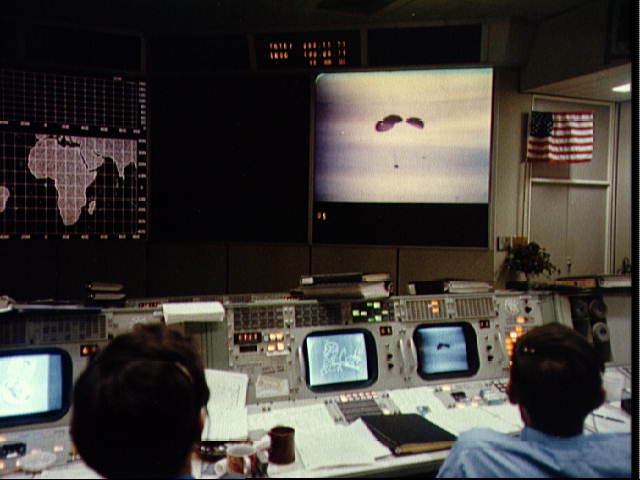 The large screen in front the front of the room shows the spacecraft with its parachutes deployed as it heads for splashdown in the Pacific Ocean. The Apollo 13 spacecraft splashed down at 12:07:44 p.m., April 17, 1970.